A SURGE IN US infants born with symptoms of withdrawal from heroin or strong prescription painkillers is driven largely by rising drug use among women in rural areas, a new study has found. The problem in urban and rural areas was about the same in 2004 — about 1 in 1,000 births were affected. But by 2013, the rural rate had climbed to almost 8 in 1,000. In urban areas, it reached 5 per 1,000 births. The rates correspond with women’s use of opioid drugs during pregnancy. This includes use or misuse of oxycodone and other prescription opioid painkillers, and use of illegal narcotics. 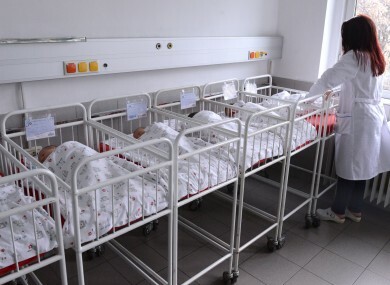 Newborns whose mothers use these drugs during pregnancy are at risk for seizures, excessive crying, problems with breathing, sleeping and feeding and other withdrawal symptoms. Treatment sometimes includes methadone and babies may need to be hospitalised for weeks or months. The study, led by University of Michigan researchers, found that about 21% of U.S newborns with withdrawal symptoms in 2013 were from rural counties, up from 13% in 2004. To come up with their estimate, the researchers analysed a dataset of US hospital discharges compiled by the government’s Agency for Healthcare Research and Quality. The results were published last Monday in JAMA Pediatrics. Earlier studies also found an increase nationwide, and other data show rural areas have been hard hit by the U.S. opioid epidemic. The new study shows there’s an urgent need for more programs to make it easier for women in rural areas to obtain prevention services and treatment for addiction, the researchers said. Email “There's been a surge in the number of US babies born with heroin withdrawal symptoms”. Feedback on “There's been a surge in the number of US babies born with heroin withdrawal symptoms”.